Heat oil in a large, deep skillet over medium high heat. Salt chickpeas lightly, then toss into the oil and cook until brown and slighty crispy. Transfer to a bowl and set aside. Season chicken with garam masala spice, and salt. Cook in hot skillet until browned, then turn heat down to medium, cover and cook until cooked through, about 3-5 minutes more. Transfer to a cutting board. Add curry powder to hot skillet and saute for 15-20 seconds, to bloom the flavor of the spice. Add dry couscous, water or broth, and coconut milk. Sprinkle with salt to season. Bring to a boil, add veggies, then cook (stirring with a fork occasionally) until couscous is fluffy, about 5 minutes. Slice chicken into strips. Sprinkle garbanzo beans and chicken over couscous. Toss fresh sliced tomato wedges on top, Sprinkle with fresh chopped mint. Salt and pepper to taste. Serve and enjoy. Dine on fresh, Indian-inspired flavors, and find your inner chickpeace. Namaste, baby. If you love couscous. Or curry. Or anything that tastes like a mouthful of golden sunshine, you're going to love this delicious recipe for our Easy Chicken and Couscous Skillet dinner. It starts so simply. Just a few basic ingredients, from quick-cooking couscous & chickpeas to brightly colored Green Giant veggie mix. Everything about this recipe is simple, savory, and splendid. Start it off right by toasting the chickpeas in hot oil, right in your skillet. Doing so gives them a beautiful crunch and flavor, which lends just the right zing to the final dish. A little bit of garam masala spice gets sprinkled on top of our thin-sliced chicken. Once ready, just fry it up in your skillet. Using a thin-sliced chicken breast makes it easy to cook this entire meal right in a single pan, without spending any time in the oven. Hello, happiness. 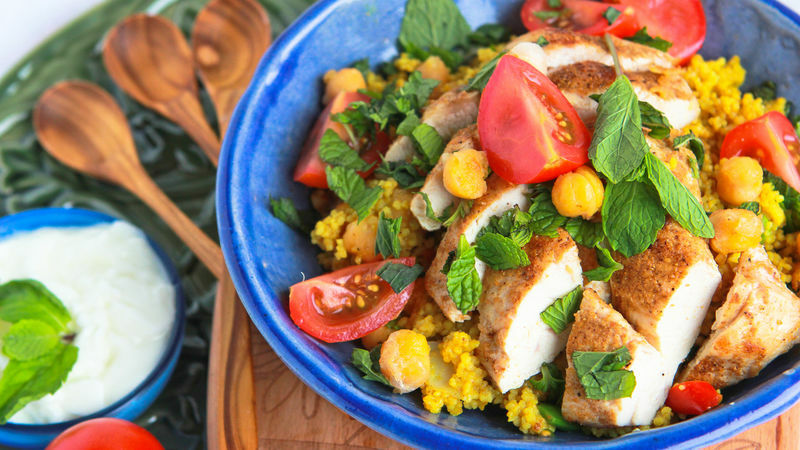 Now watch closely, because just like *that* you go from zero to hero by turning a skillet of chicken into a vibrant dish of veggies, couscous, and dinner! Couscous goes in the skillet, veggies, a few other splendid flavors. And just like that--zammo-blammo-whammo- dinner is done! And dinner, dear people. Is soooo delicious. Did we mention…pretty? Pretty darned delicious. Pretty gosh, darned deeeelicious, indeed.